LOCATION.--Lat 41`03'42", long 76`40'50", Montour County, Hydrologic Unit 02050206, on left bank 60 ft upstream from bridge on State Highway 54, and 0.7 mi north of U.S. Post Office in Washingtonville. PERIOD OF RECORD.--May 1979 to current year. GAGE.--Water-stage recorder. 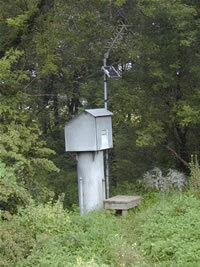 Datum of gage is 503.70 ft above National Geodetic Vertical Datum of 1929 (Pennsylvania Power and Light Co. bench mark). Satellite telemetry at station.